Worldwide, there are several cities, that must be among the top 10 places that every self-respecting traveller should visit. 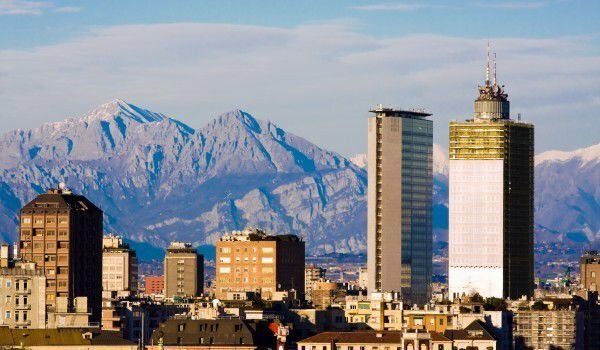 Milan is a city of dreams and enters this list, ranking as one of the top positions. Milan is its own architectural masterpiece. It's the industrial, cultural and artistic heart of Italy. Milan is one of the world's fashion capitals , where the most elite designers first show their new models. Milan is both a fast and quiet town with nightlife and nice quiet afternoons. The music never stops here - be it opera stage or open pop concerts. Milan has a tradition in sport, especially one with its football clubs, AC Milan and Inter. It may sound clichéd, but Milan has everything. You can not tour Italy, without seeing this inspiring city that gave mankind a number of geniuses. Milan is the largest and main settlement in the most advanced Italian Province - Lombardy. Here in Northern Italy, the global fashion capital equal occupies the lands of Lombardy, it is located near the river Po. Milan is the second largest city in the country. Nearly two million people live in the city, and with the population in the provinces, the inhabitants of Milan are about 4 million. The history of Milan began more than 2500 years ago. Around 400 BC, Celts inhabited Milan and the surrounding area. In 222 BC, Romans conquered this city, which had received the name Mediolanum. In 293, after several centuries of Roman control, Milan was declared capital of the Western Roman Empire by Emperor Diocletian. Diocletian chose to remain in the Eastern Roman Empire (with its capital in Nicomedia) and his colleague Maximian - the Western Empire. Maximian built several gigantic monuments and a large circus (470 x 85 m), Thermae Erculee, a large complex of imperial palaces and several other buildings. In the 8th century Milan was part of the Roman Empire. Today, the birthplace of Silvio Berlusconi is a modern, dynamic, yet sophisticated city that has its own style and unique charm. 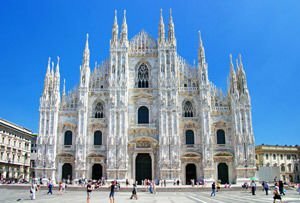 Tours of Milan must start from the central Piazza del Duomo, which astounds with its beauty. Largely due to the uniqueness of the square of Milan Cathedral (Duomo), which is one of the highest in the world thanks to its 108 m height. Duomo is built on the site of the ancient cathedral of V century, which was named St. Augustine, and was partially destroyed by fire in 1075. Construction of the present cathedral began in 1386 and was finalized only in 1805. First architects of the cathedral are Marco Solari and Giovanni Solari de Corona. At Milan Cathedral on May 26, 1805 was crowned the King of Italy, Napoleon Bonaparte. Duomo is built of white marble, and intertwined in it are architecture styles that were in vogue for several centuries, during which it was built. The facade and interior are a mix of Gothic, Baroque, neo-classical and neo-Gothic cues. 3400 statues can be seen in the cathedral, which extends a total area of 11, 700 square meters. At the top of the highest boom, in 1774, was placed a gilded statue of the Madonna la Madonnina dorata. From the roof of the cathedral, to which tourists can reach the stairs or an elevator, is a view over the city. Piazza Duomo is the main square in Milan, and within it are the no less attractive historical monuments of the cathedral Galleria Vittorio Emanuele II, which has a cross with glass ceilings and where there are many famous shops and restaurants. Here is the Royal Palace (Palazzo Reale). Tourists in Milan can easily reach Piazza del Duomo by metro. On the other side of the gallery is located La Scala - one of the most prestigious opera houses. Among the major tourist attractions in Milan is Sforzesko castle, built in 1368 with the objective to defend the city. Currently it houses an art gallery. Be sure to visit the church "Santa Maria delle Grazie" in Milan, where the famous "Last Supper" by Leonardo da Vinci is. The Natural History Museum is located in City Park, and it exposes collections of various minerals and models of real objects from plant and animal species. Fashion traditions of Milan can be tracked on Montenapoleone Street and its intersecting streets. Here are shiny and extravagant boutiques and the chic clothing designers of all the world. The latest fashion can be found on the streets Via Dante, Spirit Santo, Durin and Sant Andrea.